If your idea of camping is a quiet walk through the woods before returning to your rustic hotel, your regular brushing habits will be perfect for your trip. 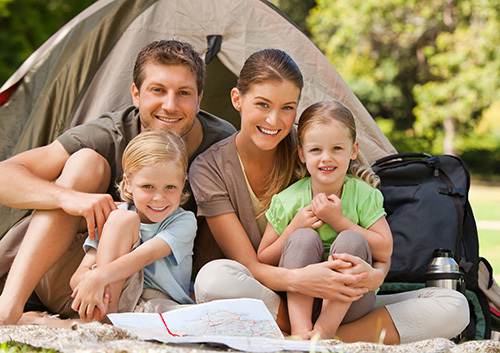 But if you are hiking into the mountains with your tent, backpack, and camp food, Dr. Deak and our team have some suggestions to adapt your dental routine to the great outdoors. If you wouldn’t drink it, don’t brush with it! Use bottled water if you have brought it, or make sure the local water is safe by using a testing kit. Boiling, filters and purification tablets are all ways to make sure the water tests clean and safe. You aren’t the only one in the woods who finds your toothpaste tasty. Bears, raccoons, and other animals are attracted to the scent of your toothpaste, so keep it safe with the same kind of tightly sealed, odor-proof container that you keep your food in. And if you want to discourage unwanted visitors, don’t spit your toothpaste out at your campground! It’s better to go some distance from your site and bury any paste, and best of all to spit used toothpaste into a container that can be tightly closed and removed from the campsite when you head for home. This practice protects you and the environment as well, since toothpaste can be harmful to small animals and plants. While there are disposable and camping toothbrushes available, a regular toothbrush will work as well. Normally, air-drying is the healthiest option for drying your toothbrush, but camping is an exception. Just as animals are attracted to toothpaste, they are also attracted to your toothpaste-scented toothbrush. Keep it in a sealed container that is odor-proof. There are websites devoted to the many ingenious ways to use dental floss while camping, but we recommend the original use. Don’t forget to floss regularly, keep it in a sealed container, and do be sure to take used floss out of the area with you. Even though you are roughing it, stick with your home routine as much as possible. If you are unable to brush as usual, rinse your mouth well with clean water and brush when you can. Have a great trip, and just one more thought—maybe go easy on the s’mores. Let us know all about your trip during your next visit to our Elyria office!